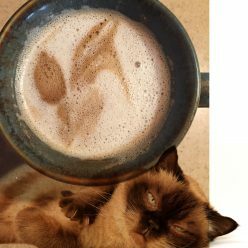 After my Delonghi Cappuccino Maker bit the dust (I consistently tamped too hard, which ended up breaking the machine over 2-3 years), I researched a new replacement cappuccino maker. After looking over many options, including some pod machines, I settled on Mr. Coffee Cafe Latte Maker – it makes espressos, cappuccinos and lattes! I’ve been using Mr. Coffee Cafe now for eight months – I got it at Christmas 2017. I was a little concerned about getting it at first, because one reviewer on Amazon said that it suddenly started curdling their milk, making a huge mess. Then I remembered that the only thing which curdles milk is heat and vinegar – I concluded that the user must have run vinegar through their machine to clean it, and some residual vinegar must be remaining in the machine. No other reviewer has had that problem. My Delonghi Cappuccino Maker was great, but it was very loud, and sometimes we have guests trying to sleep near our kitchen, so noise is a concern. The main reason I did not get the newest Delonghi was because several reviewers mentioned that it vibrated so powerfully it moved the whole machine along the counter, causing the coffee cup to fall of it, etc. So I knew I did not want that. I asked in the questions about Mr. Coffee Cafe, and was told it was not loud. They were wrong. I love my Mr. Coffee Cafe, but it is very loud. Not only is it loud when you pull your espresso shots, but if you make a cappuccino or a latte then you have to run it a second time for it to self-clean steam through the nozzle. That part is just as loud, too. I concluded, having tried several cappuccino makers, that generally they are all loud. Let me know in the comments below if you find one that is quiet like a cat’s purr. My favorite part of this machine is, of course, that it automatically steams and froths your milk directly into your mug – no more having to do that extra step with the extra cleaning involved. It’s really fun to watch the milk froth and pour into your mug before your espresso shots pull in – even if you don’t have a clear, glass coffee mug as shown in the product video. Can you see the bird? 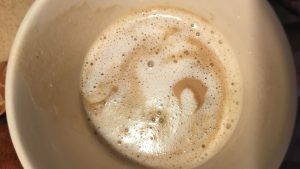 Every morning I have either a cappuccino or a latte, then when I stir, the foam forms a picture. I enjoy seeing which picture I can make out every morning – like cloud watching. I enjoy an occasional espresso late in the afternoon. Be aware that the lights will blink while the unit is heating up. It only takes a minute or less, but you have to wait for the lights to be solid and not blinking before it is ready to use. I love that you can choose to push a simple button for espresso, cappuccino or latte and let the machine do the work. Or you can manually pull your espressos, manually add extra froth, as much or as little as you want, if you choose to hand-craft your coffee. None of my previous cappuccino machines made latte, too. I love making lattes, they are so delicious. Keep in mind, though, that lattes use a LOT of milk, so you’ll run through your milk very fast. This machine works equally well with cow’s milk as well as nut milk and creamers. When I make my own homemade cashew milk creamer, I just have to make sure it’s liquidy enough and not too thick, which will clog and strain the machine. You will learn over time which milks make the best froth. Cow’s milk wins every time, but coconut creamer does a great job as does my cashew creamer. Almond milk and creamer makes almost no froth and doesn’t taste good in coffee. I’ve made 1-4 coffees a day since last Christmas, and my machine is working perfectly. Cleaning is easy. After I use up all my milk in the milk container, I rinse out the top mechanical part well and run the bottom, clear container through my dishwasher (or hand-wash it). On a daily basis, when you are done making your coffee, you pull out the milk container and store it in the fridge – remember to do that every time! Also, one user suggested buying a replacement little rubber tube piece (part of the top milk container) in case you lose or break it, so that you can keep making coffee. That clear rubber tube pops off for easy cleaning. I haven’t followed this tip because I have four other ways to make my morning coffee, so I’ll buy a replacement if and when I need one. Also, make sure to keep an eye on the water tank in the back of the machine – don’t let it ever get below an inch. I accidentally tried to pull a coffee when my water tank was almost completely empty – I panicked and filled it while the machine was running, and I haven’t yet seen any adverse effects. But generally you never want this to happen! Mr. Coffee Cafe Cappuccino and Latte Maker comes with a cute little recipe booklet with all sorts of fun recipes for espressos, cappuccinos and lattes, including alcoholic drinks. I’ve tried a few and they are a lot of fun. Be sure to experiment with your favorites roasts, grinds and brands of coffee, and share any recipes you’ve come up with below. You can buy the Mr. Coffee Cafe Barista Espresso and Cappuccino Maker on Amazon.com. Be sure to watch it – sometimes the price goes down to a great sale. But even at its full price this machine is worth it.